There are many ways that photography can feed the soul. 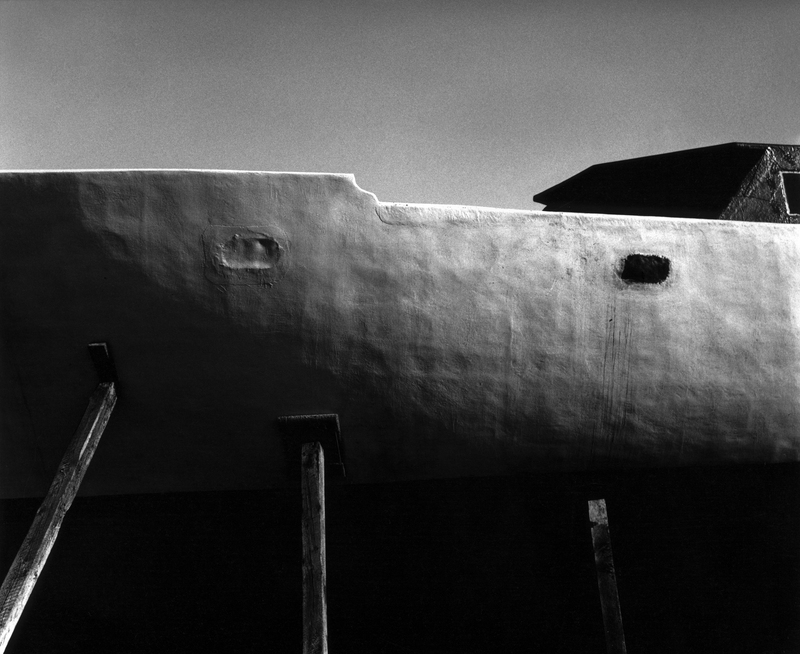 Recently I had reason to reprint Dry Dock Boat and, as the image was taking shape in the developer, my heart was activated before I even had a chance to reflect on the subject matter. Later, I decided to contemplate the impulse of heart activation, what I regard as a force of subtle attraction. In common parlance, it’s quite simply the energy of love. When working creatively, there comes a pull—felt largely in the heart—that prompts a desire to explore the subject more thoroughly, to deal with it, perhaps to sustain or intensify the feeling, deepen understanding or connection. Likely both. Whether the initiating force is a person, place or thing, there’s an urge to explore the experience further. By delving into the minutest details of attraction, connoisseurs of wine, restorers of vintage cars, collectors of all kinds and animal lovers engage their subject with a passion. Whether or not it’s financially profitable as an investment of time and energy, the engagement itself is its own reward. I don’t know who said it, but I appreciate the definition of an artist as one who is compelled to do what they do, irrespective of money, expectations or the satisfaction of others. They create because they have to. Many artists don’t know why. I suspect it’s the craving of a hungry soul. The act of creating is engagement with the energy of attraction. Love actually. For some it’s intensified by exploring the nature or appearance of the subject matter. For others the process itself, just working with the materials, can activate and deepen the initial attraction. I venture to say that for most, it’s a combination of these. For me, one of the wonderful things about the photographic film process as opposed to digital photography, is that there are greater challenges in terms of craftsmanship, more elements to deal with and wrestle toward impeccability. As opposed to manipulating pixels and printing images on machines, the process of making prints by hand is more tactile and arguably more engaging. And because the materials and processes require specialized knowledge and skill in handling as well as a discerning eye, there’s always more to learn and greater care to be taken. I photograph with a digital camera as well. But I derive more satisfaction from making rather than turning out prints. In my formulation of the creative process, attraction directs attention, which prompts exploration (consideration, testing, playing) which in turn can lead to eros that says, “This is nice. I’m getting somewhere. I’ll keep at it.” It’s love with hope or expectation. With further deepening (actually it’s an ascent) comes appreciation born of refinement—engagement in the details which, when accompanied by feelings of gratitude can lead to agape or selfless love, an appreciation of the thing itself. Love without expectation. Deeper yet is the domain of experiences, aesthetic among them, where the sensation of fullness, completeness and unity prompts identification with that energy. Even the mundane, approached with awareness or appreciation, can take us there. It’s not about the thing or the process. It’s what happens inside when we’re searching and receptive, open to be moved. As with most refinements, I’m talking about very subtle energies here. These are not exciting, emotional or dramatic experiences. The world is full of these. Feeding the soul is not like taking a pill. Neither is it an exercise that requires a substantial commitment of time, money or discipline. It’s a matter of simply being and paying closer attention to whatever stimulates a pull, the energy of attraction. Strong enough love that it prompts an immersion into the details. Our family was on vacation in Toronto. I’d never been there before, so on an afternoon when I had some time to myself, I drove around looking for places to photograph. Being naturally drawn to boats, piers and marinas, I followed the waterways south of the city and came upon an area where several boats were drydocked. There were no fences and no one was around to ask permission, so I wandered the site and made several hand held exposures with my 2 1/4 camera.